A car carrying five people and a lorry were involved in a crash which shut part of the A1M near Peterborough this afternoon. 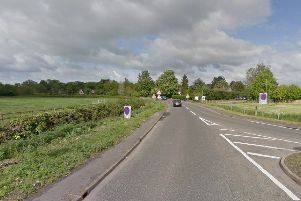 Emergency services were called at 1.07pm this afternoon (Monday July 9) with reports of a collision on the A1M northbound at Glatton, between Sawtry and Stilton, involving a Peugeot and a lorry. The driver of the lorry is uninjured. The driver of the Peugeot, a woman, has suffered minor injuries. Five people were travelling in the Peugeot, including the driver , and one passenger was trapped but conscious and breathing. The A1M northbound was fully closed and the air ambulance landed on the carriageway. Traffic was being diverted via the 'Hollow Square' diversion route and there were delays of more than two miles back towards Alconbury. The road was cleared and fully reopened at around 3.10pm.